In commemoration of the 100th Anniversary of Catholic Charities, we are renovating and remodeling the garden located at the St. Vincent Center building and rededicating it to become the St. Vincent’s Centennial Garden. We are redesigning the entrance of the St. Vincent building by enhancing both sides of the garden which adorn the two existing Timothy Schmalz Sculptures of Christ: “Whatsoever You Do” and “Homeless Jesus” with commemorative bricks. This will create a welcoming gateway to Catholic Charities for all who pass through our doors. The brick garden program provides an exceptional opportunity to recognize, honor, or memorialize a loved one, or celebrate a special time or event in a life. Engraving a person’s name on a brick in this beautiful garden makes an enduring tribute in recognition of anyone who has enriched your life or whom you have shared a special memory with. Each brick represents a unique tribute to a loved one. Bricks are available for a contribution of $400. Each brick is 7 ½ x 3 ¾ inches in size and can have up to three lines of wording, 20 characters per line. Characters include spaces and any punctuation. Please be sure your engraved information is spelled correctly. 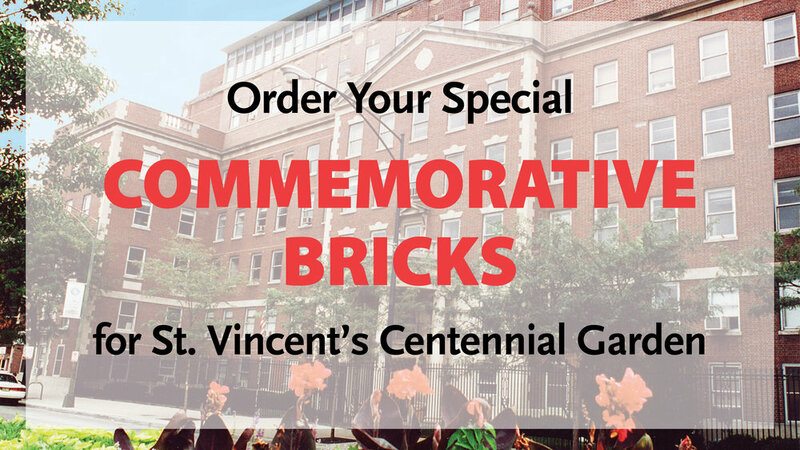 Replica Bricks may be purchased for $50 each and are smaller replicas of the original brick in the St. Vincent Centennial Garden. Replica bricks can be used as a paperweight or given to a loved one or friend as a treasured memento. The St. Vincent Center, which today is the headquarters for Catholic Charities, has played a prominent and extraordinary role in the life-affirming, charitable history of Catholic Charities of the Archdiocese of Chicago. In 1881, the St. Vincent Hospital and Infant Asylum, popularly known as St. Vincent’s Orphanage, was founded by the Daughters of Charity of St. Vincent de Paul at 721 N. LaSalle. The current building was designed by Holabird & Roche in 1927 and has withstood the decades of change seen in the River North neighborhood and been a beacon of hope to all who pass through the garden gates and walk through the doors. The St. Vincent’s Orphanage provided 91 years of selfless service and care to many thousands of poor or unwed mothers and their infants and children; orphaned, abandoned and neglected children; and foster and adoptive families. The orphanage closed in 1971 and in 1972 Catholic Charities began occupying the 721 N. LaSalle building which quickly became the agency’s central hub to help with the continued need for serving the poor and less fortunate throughout Cook and Lake counties. Today, the spirit of St. Vincent lives on in the compassionate and professional work of Catholic Charities. A blessing and dedication of the St. Vincent Centennial Garden will occur in June at a date to be determined. All brick orders received by May 14 will be installed and part of the blessing and dedication event. Invitations to the June event will be mailed to all who purchase bricks by May 14. Brick orders received after May 14 will be installed by the end of the summer. Brick orders will be taken on a continuous basis. You will be notified when your brick has been placed in the Garden.